Today we are going to talk about three prepositions that are connected to time and tenses. One could make the following logical conclusion. Use om whenever there is inin an English sentence. Unfortunately it doesn’t work like that. There is no such rule. The truth is that på is a very universal preposition but if you want to look like a someone who cares about the language please, do not follow the above mentioned rule and use it only when it should be used. Prepositions are always a hard nut to crack in any language. And what I mean by that is that you need to learn how to use them by heart. Good luck with learning Swedish and see you very soon. Bye bye! Don’t forget to comment this lesson or give it a like. Your feedback is very important and it helps me make the lessons better. Did you like the lesson? It is possible to support MySwedish now! You can buy me a cup of coffee and a cake if you want to. Any support is appreiciated :-). Subscribe for MySwedish news and get our e-book for free as a gift. Speak Swedish like a native contains 30 native expressions and tips&tricks that help you master the Swedish language. 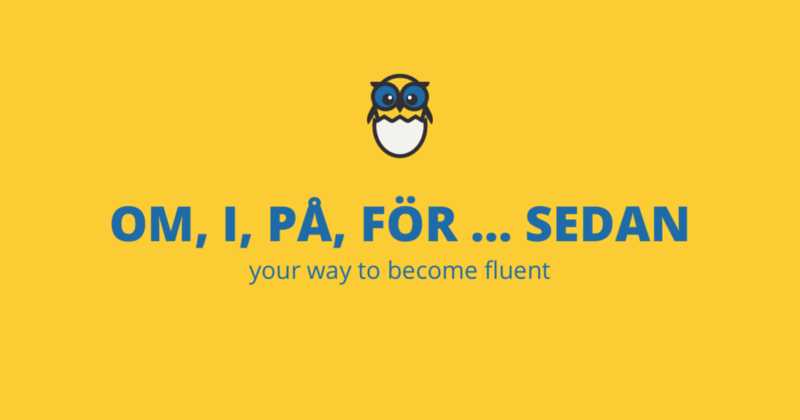 You can now have a one-on-one online lesson with a native speaker.Choose the time that suits you today become fluent in Swedish even faster. And never miss a new lesson again. We promise no spam and only quality content. © Proudly produced by Drahomír Posteby-Mach, 2019.